I decided to enter a card for the Copic Creations challenge. I don't have much experience yet with Copics but I think this turned out so cute! I just love it. This is adorable. 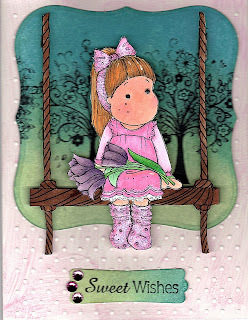 Tilda looks so cute sitting on her swing and your coloring is wonderful. Thanks for joining our Copic Creations challenge.